The Kundalini Yoga tradition speaks of a call to the Divine that awakens Ã¢â‚¬Å“the Original Light of the soul.Ã¢â‚¬Â Through meditation, prayer, and sacred song, those of all faiths can connect with this illuminating sourceÃ¢â‚¬â€Kundalini, the universal energy of awareness and healing that awakens within. 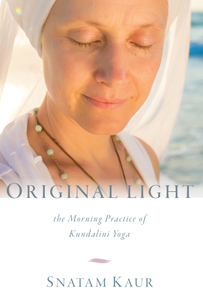 With Original Light: The Morning Practice of Kundalini Yoga sacred chant artist Snatam Kaur takes us into the heart of the path, as taught in the Aquarian Sadhana, its primary guide to daily practice. This book and 2 CD set offers Kundalini Yoga's key principles, enriched by Snatam Kaur's stories and insights as a lifelong practitioner. She then teaches its five stages of practice, including preparation, sacred recitations, breathing fundamentals, energizing yoga sets, meditations, morning chants, and more.